Coastal flooding will become more frequent as global sea level continues to rise, a new research has found. Scientists have estimated that even small amounts of sea level rise, at 5-10 centimetres, can double the frequency of extreme water level events—and this can happen as soon as 2030. 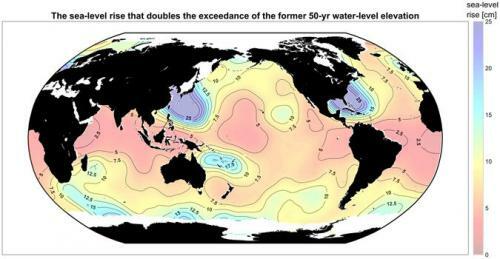 A global-level analysis of rising sea levels was published in journal Nature. Global sea level is currently rising at approximately 3–4 millimetre a year and is likely to accelerate due to ocean warming and land-based ice melt. It is expected to rise between 0.3 to 2 meters by the end of this century, depending on greenhouse gas emissions. Apart from increased coastal flooding, rising sea levels cause increased beach erosion, groundwater inundation, changes in wave dynamics and passive inundation of low-lying coastal areas due to high tide. Communities in these areas lose property and livelihood, and are eventually forced to migrate. As per a calculation by the United Nations, 40 per cent of the world’s population lives within 100 kilometres from a coast. Asia has the highest coastal population and China, India, Bangladesh, Indonesia and Viet Nam will be the most exposed. As per the analysis of water level observations, the tropical region of the world is more vulnerable to rising sea level. This means, that the probability of flooding is higher in these regions as compared to other parts of the world, for the same amount of increase in sea level. Some 20 of the economically largest tropical cities face “a dire future” in face of coastal flooding, as per the study. The list includes Mumbai and Kochi from India, along with Grande Vitoria and Abidjan in other parts of the world. This finding presents a threat to the very existence of many low-lying islands between the tropics. The islands are vulnerable to flooding from storms today, and a significant increase in flooding frequency with climate change will challenge “the very existence and sustainability of these coastal communities across the globe”.